(via NASCAR Wire Service) FONTANA, Calif. – The best measure of Joey Logano’s dominance in Saturday’s Roseanne 300 at Auto Club Speedway came during one of the rare instances when the driver of the No. 22 Team Penske Ford didn’t have the lead. Off-cycle on pit stops late in the race, Logano chose to pit under caution on Lap 122 while most of the other contending cars stayed out on tires that had only six green-flag laps of use. Logano restarted 16th on Lap 125. By Lap 126, he was third. On Lap 127, Logano passed Justin Allgaier for second. One Lap later he sailed past Elliott Sadler for the lead. 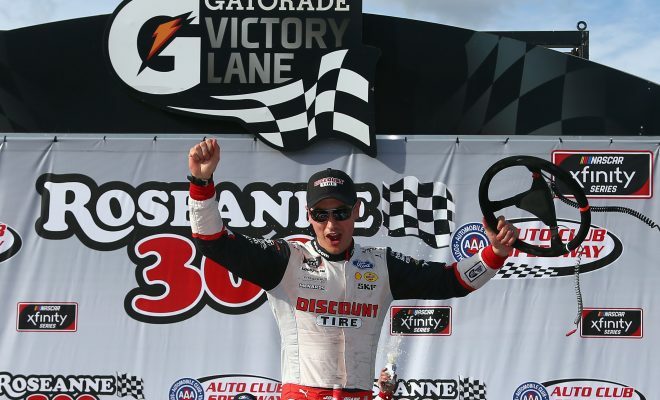 In claiming his first NASCAR Xfinity Series victory of the season and the 29th of his career, Logano survived a late restart on Lap 143 and pulled away to win by 1.429 seconds over Allgaier, who passed Sadler for the runner-up spot. That didn’t keep Logano from second-guessing crew chief Brian Wilson for choosing to keep Logano on the track after a Lap 110 caution for Dylan Lupton’s blown engine. “Brian opted (to stay out),” said Logano, who won the first and second stages of the race. “That was not my thought at all. But it ended up working out. I thought we were going to lose more track position than we did. We were able to stay out front, actually, on older tires, which I didn’t think we had a chance of doing. Allgaier edged Sadler for the runner-up spot by .047 seconds, but much earlier than that Allgaier realized he was probably racing for second place, the position he also claimed a week earlier in Phoenix when Brad Keselowski drove the No. 22 to victory for Team Penske. “The 22 was definitely the class of the field today and had everybody covered,” Allgaier said. “So hats off to those guys. Austin Dillon ran fourth behind Sadler, followed by Richard Childress Racing teammate Daniel Hemric. 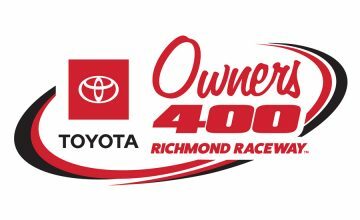 Cole Custer, Tyler Reddick, Matt Tifft, Ryan Preece and Ross Chastain completed the top 10. Pole winner Christopher Bell brushed the wall early, spun off Turn 4 on Lap 97 and was collected by the No. 5 Chevrolet of Michael Annett eight laps later. Bell salvaged a lead-lap, 21st-place finish and held fourth place in the series standings. Sadler leaves Auto Club with a slim lead over his JR Motorsports teammates. Reddick is second in the standings, four points back, with Allgaier five points behind Sadler in third. 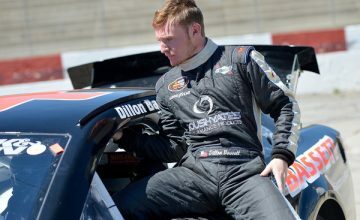 The NASCAR Xfinity Series will have two weeks off before returning to action at Texas Motor Speedway for the My Bariatric Solutions 300 on April 7 (3 p.m. ET on FOX, PRN , SiriusXM). Pit Notes: Post-race inspection found that the No. 18 Joe Gibbs Racing Toyota (driven by Ryan Preece to a ninth-place finish) had one lug nut unsecured. The No. 7 JR Motorsports Chevrolet, the No. 18 JGR Toyota, the No. 21 Richard Childress Racing Chevrolet and the No. 22 Team Penske Ford will all be heading back to the NASCAR R&D Center in Concord, North Carolina.